Nimki Mukhiya actress Garima Singh to make debut in 'supernatural space' with THIS show! Actress Garima Singh is all set to make her debut into supernatural space Star Plus' popular show. Nimki Mukhiya actress Garima Vikrant Singh will enter the supernatural space with the TV show Nazar. "I'm excited about making my debut in the supernatural genre. I'm playing a character named Panna. It's a strong role with grey shades," Garima said in a statement. She is happy to reunite with producer Gul Khan. "I had worked with Gul Khan earlier on a show called Chaand Ke Paar Chalo. I am happy to reunite with her," she added. Garima has also acted in shows like Gustakh Dil and Choti Bahu. Nazar is a supernatural show airs on Star Plus, produced under Gul Khan's 4 Lions Films. The story revolves around an evil Daayan and the troubles faced by the family under her nazar. The show features actors Niyati Fatnani, Harsh Rajput and Antara Biswas. Are you excited to watch Garima in the show? Drop in your comments below. 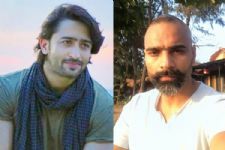 #EXCLUSIVE: Yeh Rishtey Hain Pyaar Ke Writers Allege Shaheer Sheikh of 'lifting' Words; He Refutes!